This is an image I found on the internet. I was driving along the other day and I saw a satellite dish with tinsel on it. If I could have, I would have stopped and taken a quick picture. I drove away chuckling. Folks, don’t do that. Tinsel is made of a metallic foil that really messes with all sorts of radio waves. I am sort of surprised this person isn’t seeing problems with his satellite reception… then again maybe he is. It’s possible he just didn’t put two and two together. 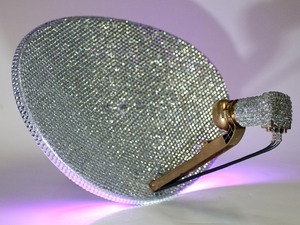 There are actual dish covers you can put on the reflector of your dish that don’t interfere with its operation. That’s because when properly applied, they reflect the signal as well as the dish’s own reflector. Dish heaters work on the same principle. They work very well as reflectors. Tinsel, on the other hand, is not a very good reflector. In fact it’s quite the opposite. If you were to think of something that scattered radio waves very effectively, it would be hard to think of something better than metallic tinsel. It has an odd shape and it has plenty of little places for signals to bounce around until they dissipate completely. In fact, a very similar product is used to dispel static electricity in dry areas. Static electricity is not really that different from the electromagnetic waves that make up a satellite signal. If people actually buy the product to get rid of electricity, is it really the best thing to put on your dish? Take some advice, friends… decorate your roof. Enjoy yourself. Just keep everything several feet away from the dish.